A massive mortality of wood frogs (Rana sylvatica) and spotted salamanders (Ambystoma maculatum) was reported in early July in a pond in the Quebec City area. More than 500 wood frog tadpoles were found dead on this site within 4 days. 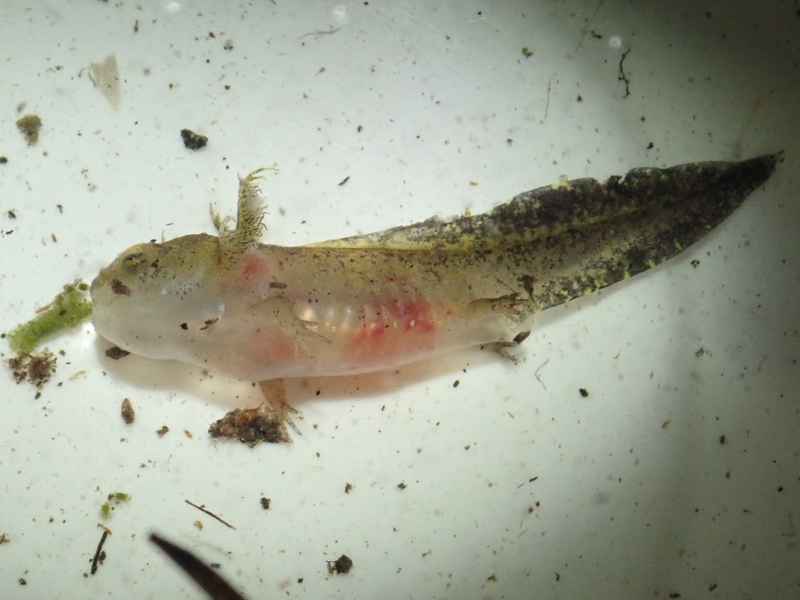 Over thirty larvae of spotted salamanders and one adult wood frog were also found dead 10 days after the beginning of the tadpole mortality. These two species have been breeding in this pond since 2012, and this is the first time that mortalities have been observed. The other organisms present in this pond (insects) did not seem to be affected. Several of the salamander larvae presented areas of hemorrhages on the skin (figure 1). The adult frog and some salamander larvae were submitted to the CWHC – Quebec Regional Center for analysis. Histological examination of the frog revealed foci of necrosis in the bone marrow and skin. A slight inflammation of the skin was also present. Foci of renal hematopoietic cell necrosis and muscle hemorrhages were present in the salamander larvae. The presence of food particles in the gastrointestinal tract indicates a rapid death following a disease of very short duration (the larvae fed shortly before their death). Figure 1: Larvae of spotted salamander (Ambystoma maculatum) found dead following an infection with Ranavirus. Note the presence of haemorrhages in the skin. Photo credit: Frédérick Lelièvre. The clinical presentation (acute massive mortality affecting more than one species of amphibian) and the histological lesions observed in these cases are suggestive of an infection by viruses of the genus Ranavirus (family Iridoviridae). This suspicion was confirmed by the detection of a Frog Iridovirus using a molecular method, in both the frog and the salamander larvae (PCR done at the British Columbia Animal Health Center). A diagnosis of Ranavirus infections, probably “Frog Virus 3 (FV3)”, was therefore made. These viruses have been associated with epizootic mortalities in different amphibian species (including wood frog and spotted salamander) in America, Asia and Europe. The virus most commonly implicated in amphibian mortalities in North America is the “Frog Virus 3 (FV3)”. Salamander larvae, tadpoles, and post-metamorphic frogs are the most susceptible stages of development for the virus. Interestingly, Ranaviruses can also potentially cause mortality in reptiles and fish. Although the presence of Ranavirus has already been documented in Quebec (see Paetow LJ and D’Aoust-Messier), it is, to our knowledge, the first report of a mortality episode associated with this viral infection in amphibians in the province. Cases of fatal Ranavirus infections have been reported in Ontario, in the western provinces and the Maritimes. Reports of epizootics caused by Ranavirus appears to be increasing in frequency. This apparent emergence of these viral infections could be associated with the introduction of new human pathogenic strains of virus into naive amphibian populations. For example, the use of amphibians as bait for fishing is often proposed as a factor that could promote the dispersal of these viruses into new areas. It has been suggested that infections caused by Ranaviruses may contribute to the observed decline of several amphibian populations. Although there is no known control method, different measures can be put in place to limit the spread of these viruses from one pond to another. For example, equipment should be disinfect especially when frequenting areas where mortalities have been observed (ex: disinfection with a solution of bleach at 3% for one minute). In order to limit the risks of introducing these viruses into a new environment, it is advisable not to release amphibians or reptiles to a site other than the one where they were collected. Paetow LJ, Pauli BD, McLaughlin JD et al (2011) First detection of Ranavirus in Lithobates pipiens in Quebec. Herpetol Rev 42:211–214. D’Aoust-Messier AM, Echaubard P, Billy V, Lesbarrères D. Amphibian pathogens at northern latitudes: presence of chytrid fungus and Ranavirus in northeastern Canada. Dis Aquat Organ. 2015 Mar 9;113(2):149-55.